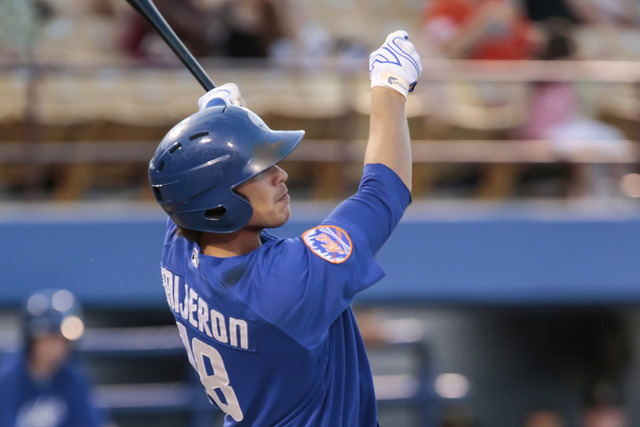 Travis Taijeron had a huge night, mashing a home run, a double and three RBIs to lift the 51s to a 9-1 victory over the Reno Aces on Thursday at Cashman Field. It’s time for the baseball world to start paying attention to Travis Taijeron. The Las Vegas outfielder had a huge night at the plate, mashing a home run, a double and three RBIs to lift the 51s to a 9-1 victory over the Reno Aces on Thursday night at Cashman Field. The 51s started the onslaught in the second inning, jumping all over Reno starter Kyle Drabek. The inning began with a Johnny Monell single before Taijeron blasted Drabek’s 88 mph sinker over the wall for a 2-0 lead. That wasn’t all for Las Vegas that inning. Four batters batters later and with two men in scoring position, Dilson Herrera sent a double over the center fielder’s head for two runs. The third inning was just as unforgiving to Drabek as the second. After Eric Campbell led off with a triple, Taijeron got his second extra-base hit in two innings, doubling down the left-field line. Taijeron has been on fire lately, with Thursday a continuation of a torrid hot streak. Over his past eight games, he has slashed .457/.486/.971 for an OPS of 1.457. He finished the night 2-for-4. The homer was his 11th of the season, tying him with Marc Krauss for the team lead. He drove in his team-leading 55th RBI and scored his 47th run, second on the team. His 27 doubles lead the 51s. The score was 5-0 after Taijeron’s double, but it was far from over. A walk, a double — the second of the night for Gavin Cecchini — and a fielder’s choice made the score 8-0 after four innings. In a season that has gone as far as the offense would take it, Verrett strung together a solid outing to make it a well-rounded game for the 51s, something the manager could get used to seeing. Verrett, in his first start at Triple A this season after making 19 appearances with the Mets (four starts), allowed two hits but walked five. He threw 88 pitches, 46 for strikes, and struck out two. • Catcher Travis d’Arnaud is expected to join the 51s on their trip to Salt Lake this weekend. On a rehab assignment with the Mets, the hope is for New York to activate him off the disabled list Tuesday. He last played for the 51s last season. • The Mets recalled Ty Kelly on Wednesday, and he joined the team in New York. He has played 10 games in the majors this season. • Backman was named the Pacific Coast League’s skipper for the Triple-A All-Star Game on July 13. Backman won the 2014 PCL Manager of the Year award, and this is his first time managing the All-Star Game. He becomes the third Las Vegas manager to manage it. Saturday: Las Vegas at Salt Lake, 5:35 p.m.
Sunday: Las Vegas at Salt Lake, 6:05 p.m.
Monday: Las Vegas at Salt Lake, 6:05 p.m.
Tuesday: Las Vegas at Reno, 6:05 p.m.
Wednesday: Las Vegas at Reno, 6:05 p.m.